Organic coffee farms in Central America have typically been located at high altitudes where there has been less worry about fungal disease. However, in recent years, fungal outbreaks have increasingly-occurred at these higher elevations and organic growers may not survive the huge yield losses due to their non-use of fungicides. “Finca Santa Isabel, often held up as a shining example of success with organic agriculture in coffee, may not make it. The culprit? A fungus known as roya that often goes unnoticed until bright-orange pustules start appearing on the underside of leaves. This parasite interrupts the tree’s ability to nourish itself by redirecting nutrients to those colorful lesions. Eventually, the infected leaves shrivel up and fall off. 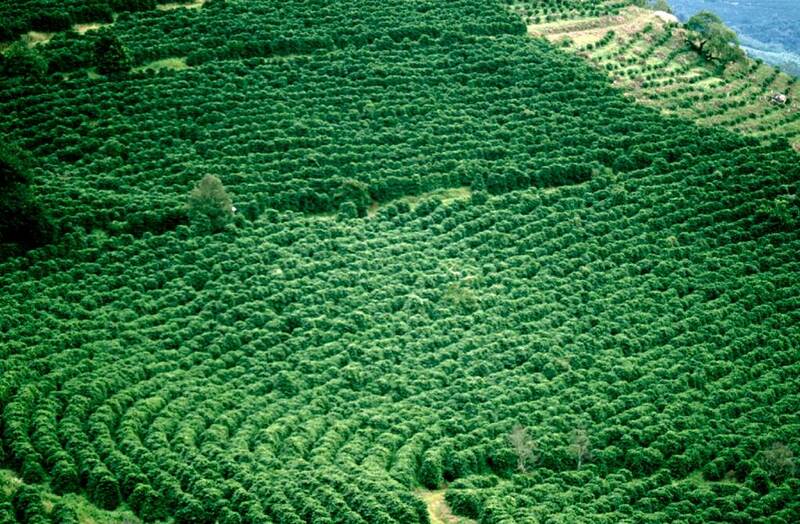 The Keller family owns Finca Santa Isabel, located in Santa Rosa, about an hour south-east of Guatemala City. It became the second estate to be Rainforest Alliance-certified in 1997, and the Kellers were named Sustainable Standard-Setter by the nonprofit in 2003. In a 2009 profile, the family was lauded for its successes with sustainable practices: caring for the land, being a profitable business, and having enough left over to help build needed infrastructure for their community. They grow Arabica at an elevation of 3,500 to 4,500 feet above sea level in a zone most growers thought roya could not thrive. But the rusk outbreak is happening almost everywhere. By most accounts, large and low-lying estates accustomed to spraying to protect their trees will survive. …Growers in areas prone to the rust use fungicide prophylactically twice a year. Spraying, which typically occurs in July and September in Central America, is timed to happen just before and just after periods of heavier precipitation. Farmers caught unprepared, like Keller, have to decide whether and how to fight this blight. Guatemalan workers on coastal farms in lower altitudes that face the Pacific sprayed ahead of time. Farmers in these regions have also planted rust-resistant varieties as part of recovering from earlier outbreaks. Those growing coffee in hillier areas at higher altitudes did not. Nor do they use fungicides routinely. Title: Central American Coffee Rust Crisis: No Easy Answers. This entry was posted in Fungicides and tagged coffee, fungicides, Guatemala, organic agriculture, roya by pesticide guy. Bookmark the permalink.